Dementia is a condition characterized by a group of symptoms that often include memory loss, hallucinations, paranoia, agitation, personality changes, problems communicating, problems with motor skills and coordination, inappropriate behavior and an inability to reason. If your loved one has any of these symptoms, schedule an appointment with their doctor as soon as possible to begin treatment. 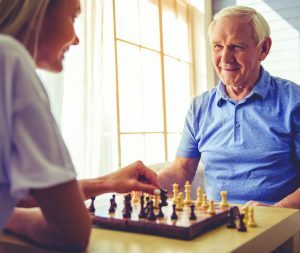 You may choose to care for your loved one at home, especially if their condition has not deteriorated too far, but dementia is a difficult condition to cope with, for both the patient and the caregiver. A common misconception about dementia is that it is described wrongly as a disease. It actually consists of symptoms of a functional disorder and is not a disease in itself. Symptoms of dementia may lead to lack of abilities in certain areas such as problem solving, loss of memory and confusion. Dementia is often found in elderly people as a harmful side effect of some mental illness, such as Alzheimer’s, and might reflect as an after-effect of a medical treatment. Symptoms of dementia might occur due to vitamin deficiencies, head trauma, or Parkinson’s disease. Dementia is mostly incurable with some rare exceptional cases. It is definitely not an easy task to provide home care for those with dementia simply because of the nature of dementia and its various symptoms. While providing home care for patients suffering from dementia, special considerations are required. Frequent change in routines and turnover within the company providing home care can have adverse effects on dementia patients. Persons providing care for dementia patients need to have special training on proper ways to approach the special care required for dementia patients. Diseases such as Alzheimer’s and related symptoms of dementia are usually chronic; they can last for ten years or more after they are diagnosed. These symptoms may include paranoia, anxiety, aggression, or agitation, making persons difficult to handle while providing home care. Appropriate support and care is thus required for patients as well as their families. Nature and intensity of care might again fluctuate as patients may go through different stages of effect of medication and treatment. Caring for a loved one with dementia can often be difficult and emotionally draining. Professional help is generally recommended although the family remains the core of a home care system. At Care Companions of Ohio, we offer a variety of non-medical services for dementia patients and their families, including personal care, companionship, shopping, transportation, meal preparation, cleaning, and respite care services. The exceptional caregivers from Care Companions of Ohio are compassionate and knowledgeable, always taking into consideration each individual’s needs when caring for dementia patients. For more information on the services Care Companions of Ohio offers in the home, please call (855) 703-8209 today. Let us help you provide the best care possible for your loved one.